← Awe Hail… Stormy Night in the Black Hills! Status of Caddie… So, after two hail storms and torrential downfalls at the campground near Hill City, SD our concerns turned toward the plane which was at the airport in Rapid City (KRAP). The weather map on the iPad had the storm that was on top of us heading straight to the airport. After limited sleep, we popped up early and drove straight to the airport to lay eyes on Caddie. She was fine! The tie downs were secure, the Bruce’s Custom Cover was a little askew, but there was no water inside or hail dings to be found. The folks at the FBO said it had not rained that much there, apparently it is usually much more severe in the hills than down on the plains where the airport is. Road Trip… So, with our fears of damage to the plane put to rest, we decided today would be a good day for a road trip. We had 200 miles per day allowance on the rental car and had only driven a hundred or so. 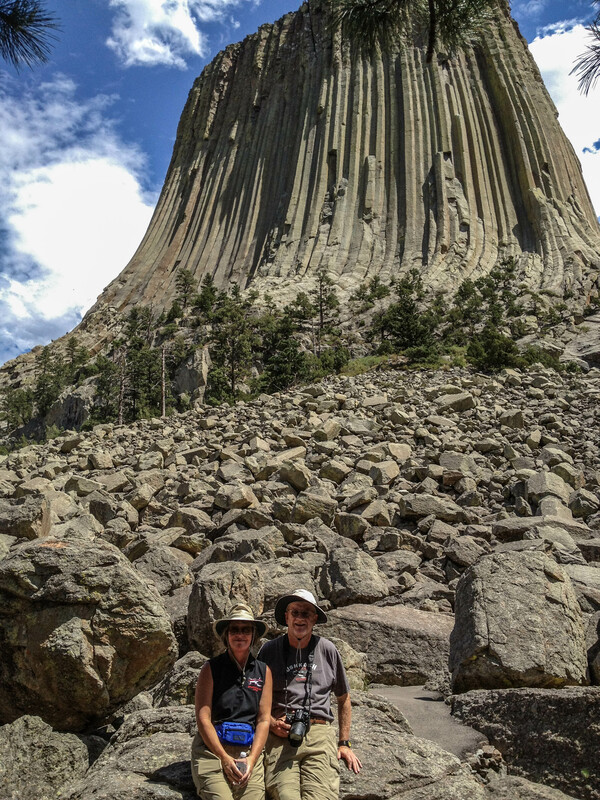 We decided to head north and then west to Wyoming to see the Devils Tower. 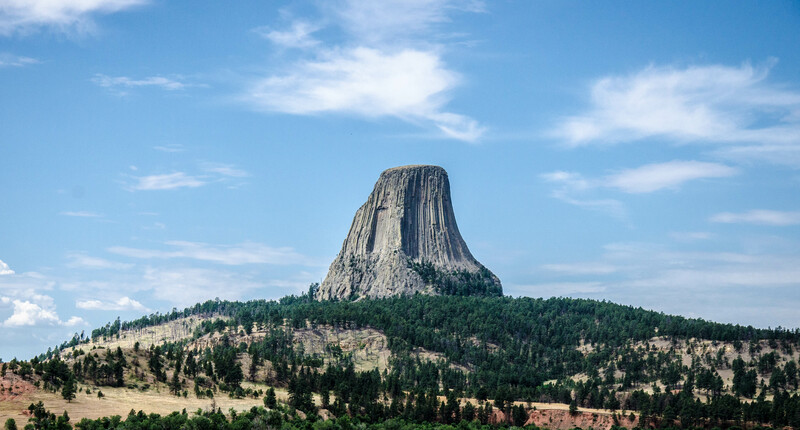 Almost Rally Time… Our first stop, up I-90, was the infamous town of Sturgis, SD, home of the annual bike rally. The rally was still two weeks away, but this little town was preparing for the arrival of thousands of biker dudes and babes! A lot of them come up early and were cruising the hills on “Softails”, “Fatboys” and choppers. We stopped at one of the large T-shirt vendors and ran into a couple of guys from Birmingham that were running the business. We bought a couple of T-shirts just to proclaim we had been to Sturgis and continued west. Close Encounter… After nearly an hour of driving, we went over a hill and “WOW”, there it was. 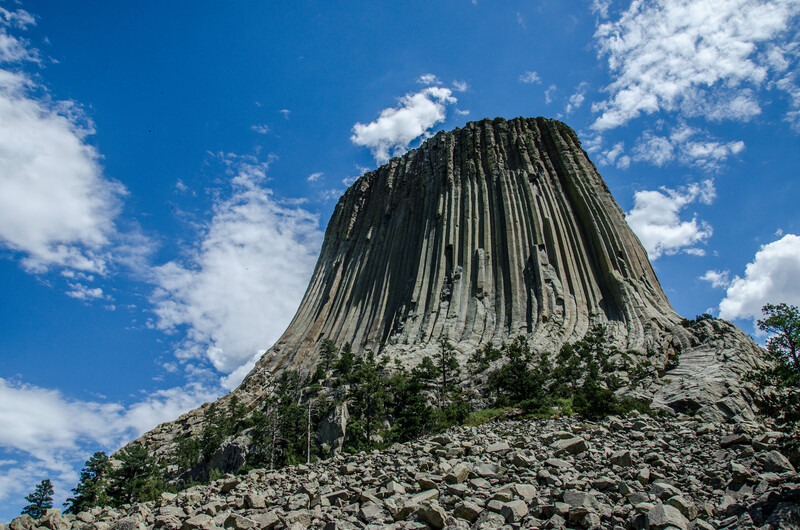 Just rising up from the plains was this large rock formation unlike anything we have ever seen. As we got closer, I could see how this site held such a spiritual significance to the local tribes. It was one of those “goose bump” moments as we arrived at the monument welcome center. The goose bumps got a little bigger when I realized there were people scaling the sides of this thing at varying elevations. I did not realize that, not only did the Park Service allow climbing on the monument, but promoted it also. While listening to a ranger give a talk about the turkey vultures (we call ’em buzzards) that were circling the monument, I heard someone behind me make a comment about “being caught in a storm in a tent the night before”. I turned around only to see Jason and his family, our new friends from North Dakota that we camped next to. 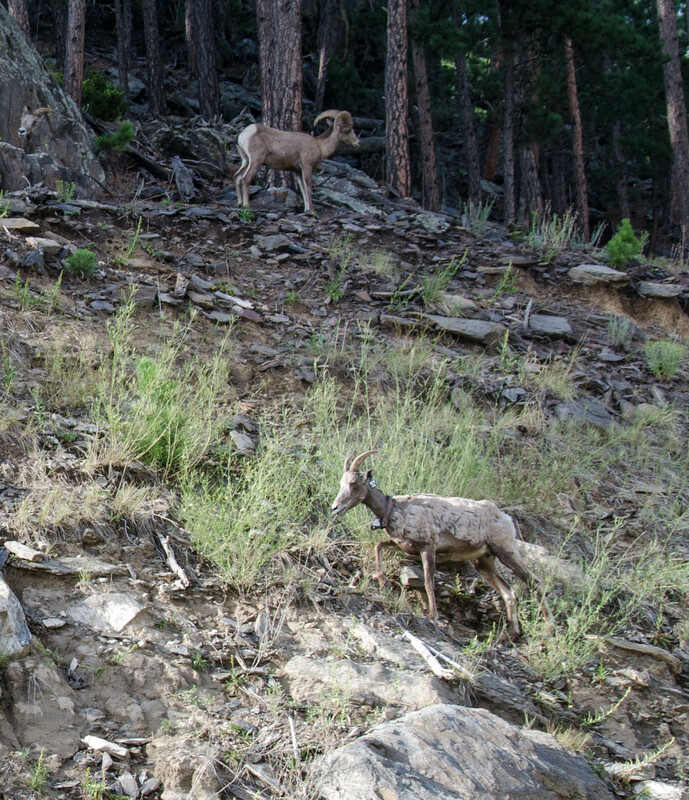 What a small world… we were over a hundred miles from the camp and they had pulled up stakes that morning to head home by way of Wyoming. “What an incredible Cinderella story!”… “Licensed to kill gophers by the government of the United Nations.”, Caddyshack’s, Carl Spackler (Bill Murray) would have come unglued at the sight of the area leaving the monument. 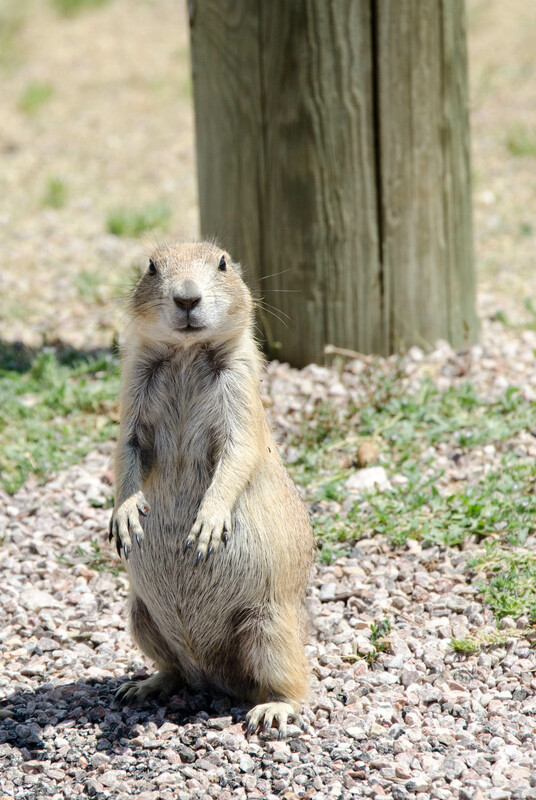 Hundred of prairie dogs infested the grounds with warning signs not to feed them. The warning didn’t keep us from stopping and “shooting” them with a camera, nor did it stop them from coming right up to you to beg. These little buggers had holes dug everywhere and kept popping up at random as far as the eye could see. More Beautiful Views… On our trek back to camp, we took the Spearfish Canyon Highway route. Once again we found ourselves looking up to some of the most beautiful bluffs and scenery we have ever seen. At the end of this road was the town of Deadwood. Besides the HBO TV series, Deadwood was best known as a gold rush town that saw the likes of Wild Bill Hickok and Calamity Jane. Now, this clean looking town has lots of saloons and gaming establishments, but would justify further investigation at a later date… we were tired! Posted on August 8, 2012, in Airports Visited, Aviation, Photography, Rapid City Regional (KRAP), South Dakota, South Dakota, States, Travel, Wyoming and tagged Airpanes, Airports, Airports Visited, Bighorn Sheep, Black Hills, Deadwood, Devils Tower, Nature, Outdoors, Photography, Prairie Dogs, South Dakota, Tent Camping, travel, Wyoming. Bookmark the permalink. 1 Comment. Amazing shots – made me wish I were I there.